Browse the current coupons & promo codes available in stores or online. 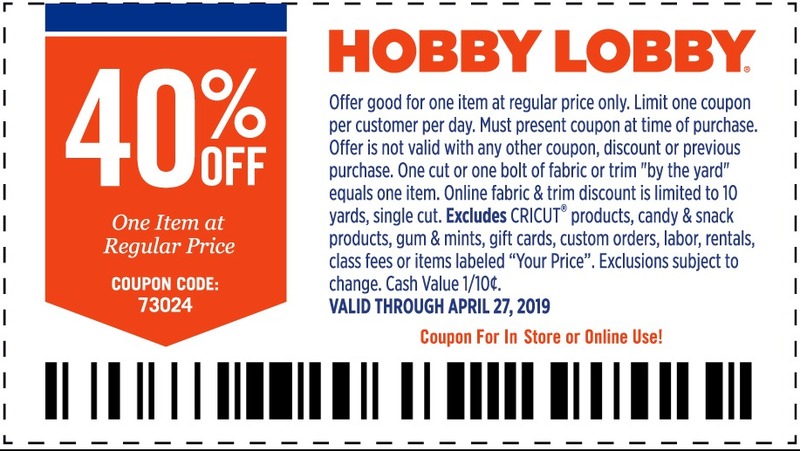 Here is the Hobby Lobby Coupon – 40% OFF Any One Regular Price Item – valid from Sunday, April 21 to Saturday, April 27, 2019. View Hobby Lobby Weekly Ad. Offer good for one item at regular price only. Limit one coupon per customer per day. Must present coupon at time of purchase, and the offer is not valid with any other coupon, discount or previous purchase. Some exclusions apply. Also, get Free Shipping on orders of $59 or more. Don’t miss our guide on Pay Less at Hobby Lobby with 40% off Coupons for Nearly Everything. Hobby Lobby follows a particular sale schedule for each department. Here is everything that you’ll find on sale as per their sale plan. Floral, frames, paper crafts, fabric once every two weeks. The time after every big holiday is massive clearance time at Hobby Lobby with discounts starting from at least 60% off and increasing to up to 90% off after. Holidays include 4th of July, Labor Day, Halloween, Thanksgiving, Christmas, and Easter among others. Clearance isles are usually also found throughout the year at the back of the store.